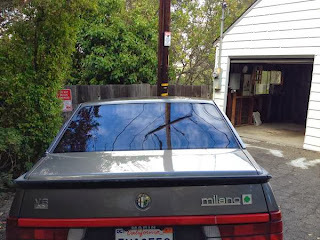 I still remember the day in 1987 when I picked up my Alfa Milano. I had signed all the paperwork the day before. The dealer offered to take care of registering it for me. That meant I had to wait a day to pick up the car, but given a choice of standing in line at the Registry (which is what we call the Department of Motor Vehicles here in Massachusetts) or waiting a day, I chose to wait. That delay gave me 24 hours to think. I laid in bed that night wondering if I made the right decision. This was a near-new car (8000 miles). It meant that I would have car payments. 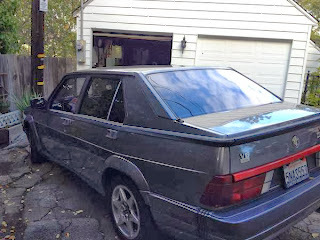 I had a running, driving Alfetta sitting in the garage. Maybe I should have spent a little money on that and made it perfect. 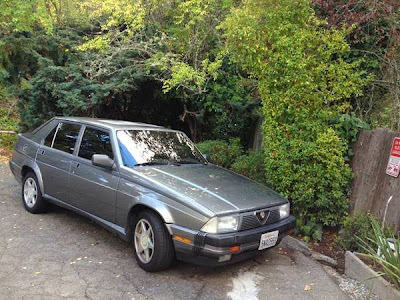 I was now relying on two Alfa Romeos to get me to and from work every day. The Peugeot 505 I had traded in on the Milano had never let me down. I did not buy the Milano from the local dealer, as they were a bunch of jerks. Would I have to deal with them for warranty work? What if I didn't like it after a year? Could I even come close to selling it for what I paid for it? (Of course not.) It was a long, near sleepless night. I never thought those thoughts again. It took about 5 minutes to get from the dealership to the highway. As soon as I got onto the entrance ramp, I put my foot into it. I fell in love. I stayed in love. It was worth every penny I paid for it. It was fairly reliable. I never had to see the local dealer. (Who was dropped by Alfa shortly after I bought the car, anyway.) Sell it? No. I wanted to keep it forever. My Milano had the 2.5 liter 6 in it. The Verde has a 3.0. It's everything that made my car so much fun with more power. Using an Alfa Romeo Milano as an everyday driver in 2014 is not something I would recommend. The newest one is now 25 years old. Parts are getting hard to come by. There are very few mechanics around who have ever seen one, let alone worked on one. But, if you are looking for a true sports sedan (not a run-of-the-mill sedan with some sporty add-ons) for weekend driving, I would highly recommend a Milano. I'm not so sure I would recommend this Milano, but I want to point it out. This is a Milano Verde. The Verde, besides the amazing 3.0 liter engine, came with just about every option Alfa offered along with some unique bits (i.e Recaro interior, small rear spoiler...). This car has 209,000 miles on it. That alone, it a testament to how good the Milano is. Prior to the Milano, seeing an Alfa with over 100,000 miles on it was rare. 200,000+ was unheard of. But, like any car, the high mileage means that if it hasn't been well maintained over the years, things are going to go wrong. Definitely soon. Probably spectacularly. The asking price is just $2490.00. 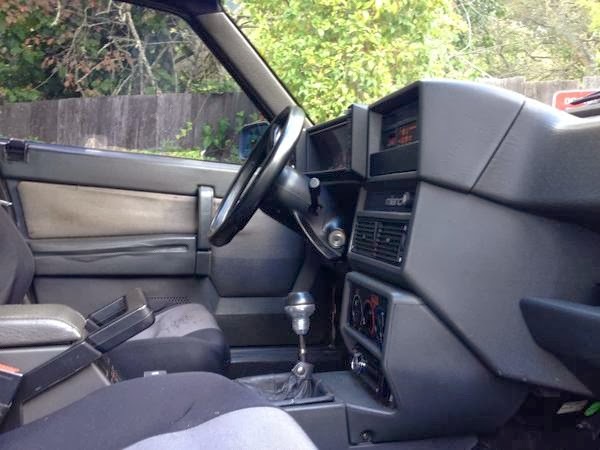 Like yesterday's Porsche 924, that alone makes the extra effort of contacting the seller for more info worth the time. If this wasn't 3000 miles away from me, I would be calling on this car. 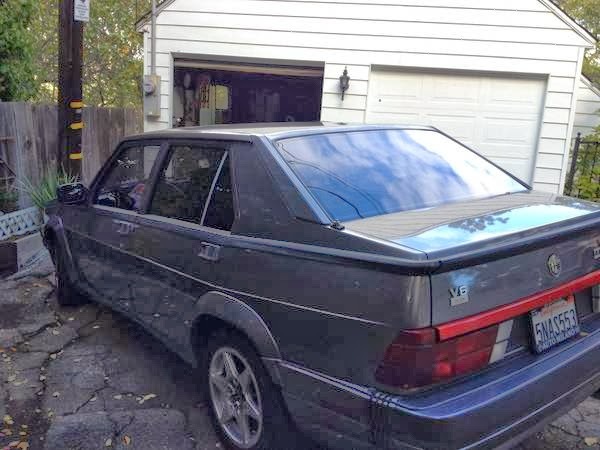 Even if I had to put another $2500.00 into it to make it roadworthy, it would still be worth the price. A Milano is a car everyone needs to experience. Located near San Francisco, CA, click here to see the Craigslist ad. I had a 88 Verde. It was a very fun car and made very nice noises. The recaro are the real deal, but almost all of them have worn fabric. The 30,000 mile timing belt, tensioner & water pump are key. The interior had some bizarre switch placements from what I remember. The inboard rear brakes are unusual as well.